Born in Issoudun in central France, Chef Didier Chantefort graduated at the top of his class when he received the Certificat d'Aptitude Professionelle (CAP) in Cuisine and the Brevet d'Etudes Professionelles (BEP). After receiving his diploma, Chef Chantefort continued training in such well known restaurants as, La Cognette in Issoudun and Le Chapeau Rouge, a Michelin-starred restaurant in Dijon. Then he decided to pursue his career in Paris and found the opportunity to polish his skills and enhance his reputation in renowned restaurants and hotels including the Royal Malesherbes, La Peniche de l’Ile de France, Le Bristol hotel, and the Hotel Lancaster, before being named Chef de Cuisine of Le Grand Cercle", and the restaurant Coconnas. 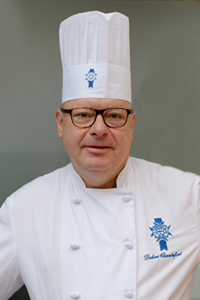 Chef Chantefort joined Le Cordon Bleu in 1992 and was named executive Chef at Le Cordon Bleu Tokyo in 1996. In 2000, he returned to France to become Technical Director at Le Cordon Bleu Paris. In 2009, Chef Chantefort became the Owner and Executive Chef of Le Goût du Jour in Menthon-Saint-Bernard, France. It was quickly recognized as one of the top restaurants in the Rhône-Alpes Region. In 2012, Chef Chantefort joined Le Cordon Bleu Ottawa as Director of Operations and Cuisine Chef Instructor and finally Le Cordon Bleu Paris team of Chef Instructors in September 2015. Chef Chantefort is an active member of the Association des Conseillers Culinaires Français et Européens and L'Académie Culinaire de France.